A couple of weeks ago, I took a look at a brief moment in the Broncos game surrounding rookie safety Marcell Harris. The specific sequence on key third and fourth down stops propelled the 49ers to a win over a then Broncos team looking to make a playoff push and provided a glimpse into what the 49ers hope to be developing at the strong safety position in the event they do not bring back Jaquiski Tartt. Today we're going to look a little deeper at Harris' past three performances. Harris was a sixth round pick (184th) overall in the 2018 NFL Draft out of the University of Florida. The safety missed all of his 2017 season at Florida with an Achilles tear and the 49ers took a chance anyway. He began the 2018 season on the injured reserve list after injuring his hamstring in training camp and came back to the practice field toward the end of October. He was later activated the week of November 1st with preparations for the Raiders game. Harris spent the first several games on special teams after being activated but injuries to safeties Jimmie Ward and Jaquiski Tartt thrust him into the starting lineup where he's seen 100% of the defensive snap counts since Week 13 at Seattle. He hasn't earned a spectacular grade from Pro Football Focus but it's worth noting that I believe that the tape doesn't match the grade as he's filled in quite nicely for the injured safeties against some of the league's best teams recently. Harris made his impact felt right away on run defense against the Broncos and Seahawks, getting several stops in key situations. Here on this play, Harris is up in the box as the "force" defender, responsible for forcing the ball carrier back to the inside toward the meat of the defense. 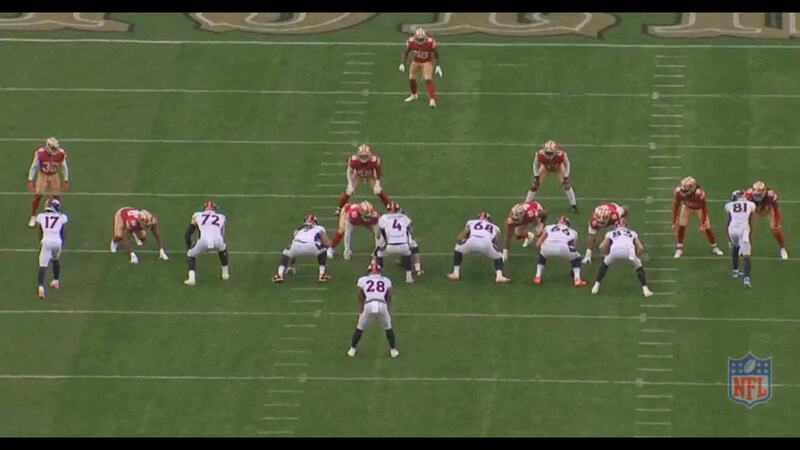 The Broncos are running a counter play to the weak side toward Harris on the right. As running back Royce Freeman takes the handoff, defensive end Solomon Thomas (No. 94) sees the pulling blockers and works inside to disrupt the point of attack. Thomas follows the "block down, step down" rule where if he sees down blocks by the line on the interior defender next to him, he'll step down into the B-gap to replace that defender. The second level safety or linebacker then fills in and sets the edge at the C-gap. Thomas executes a perfect "wrong arm" technique on the first pulling blocker through the hole that causes Freeman to bounce outside. Harris fills the force position on the edge and doesn't cede any ground to the oncoming running back coming at full speed. Thomas ends up doing most of the work here but Harris showed early on a willingness to fill in and get his nose dirty. The Broncos looked to have big play potential on this one, running to the weakside and sealing off the 49ers defense, but Harris got upfield quickly and filled in as the force with an aggressiveness not seen so far this season by anyone on defense. Later in the game, Harris again prevented a potentially big play when Thomas misread the run action of the Broncos. The Broncos run a reverse to their right with receiver Courtland Sutton (No. 14) after faking the zone stretch play to the left. The 49ers defense is caught in the middle of the field after playing the initial run action and flow away from the reverse. On the line of scrimmage, Thomas, as the backside contain defender, pursues too far down the line of scrimmage before he sees the reverse. Still, the Broncos were stopped for a one-yard loss on the play after what seemed like a potential big gain. Harris, as the "alley" defender stays backside and doesn't pursue the run action. Instead, he sees the pulling blocker fullback Andy Janovich (No. 32) getting out on the edge and pursues the reverse. Harris cuts back inside of Janovich as Sutton cuts up field but there is nowhere to go for Sutton because Harris takes outside leverage and tracks Sutton's outside hip to force him back into the defense and makes a nice open field tackle for a loss. His biggest contribution to the game occurred before the midway point of the fourth quarter on a crucial drive that the Broncos needed points on. 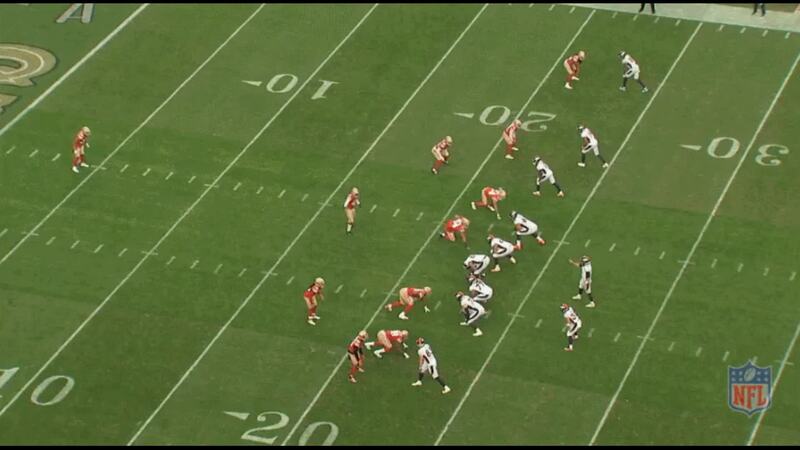 The Broncos are in a condensed formation out of 11 personnel and running inside zone to the right. Keenum hands off the ball to Phillip Lindsay (No. 30) up the middle with Harris out on the edge. Harris knives through the block of the receiver on the edge and into the backfield. His scouting report listed one of his top attributes as his ability to get downhill as a tackler. On third down, Harris, as the force defender with responsibility to "force" the ball carrier back inside, controlled the blocker and got into the backfield aggressively to tackle the ball carrier. Harris also made a key stop on a second down play late in the Seahawks game in overtime, a play that set a third and long situation for Seattle, where it would eventually take a penalty and then punt a play later. 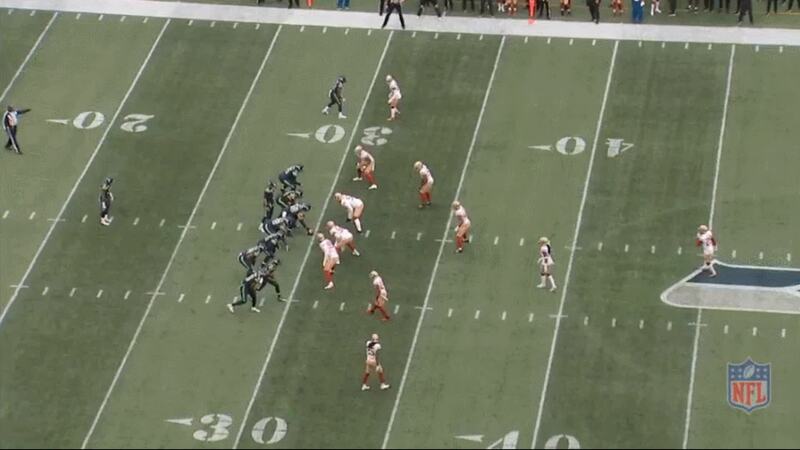 The Seahawks are running a zone read to the left, leaving Harris as the unblocked defender. Quarterback Russell Wilson reads Harris at the mesh point and decides to give to running back Chris Carson up the middle. Harris sits on the edge and forces the "give" read by Wilson but has enough lateral quickness to shuffle into the alley off the edge and tackle Carson for a short gain. Another key to this play is linebacker Fred Warner (No. 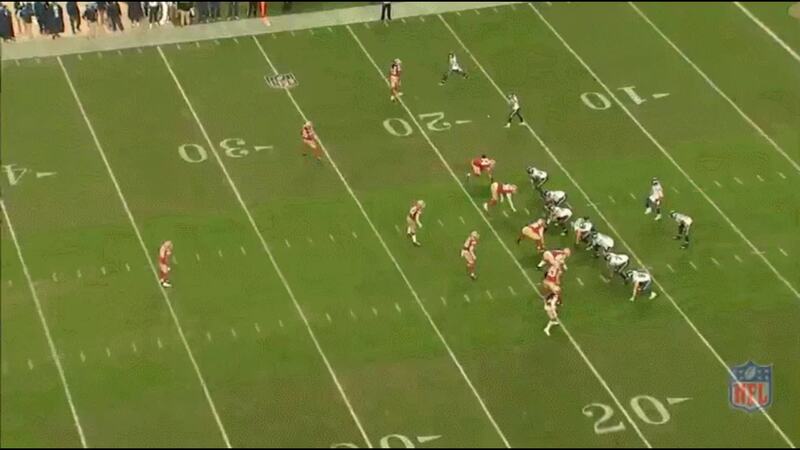 48) filling the B-gap to the play side and forcing Carson to cut back into Harris. Carson likely would've converted this into a new set of downs and kept the Seahawks on schedule in overtime but Harris prevented a big gain, instead minimizing the impact of the run and putting the Seahawks behind in the down series. Even when not in coverage on passing downs, he's still able to affect the outcome of the play as a pass rusher. 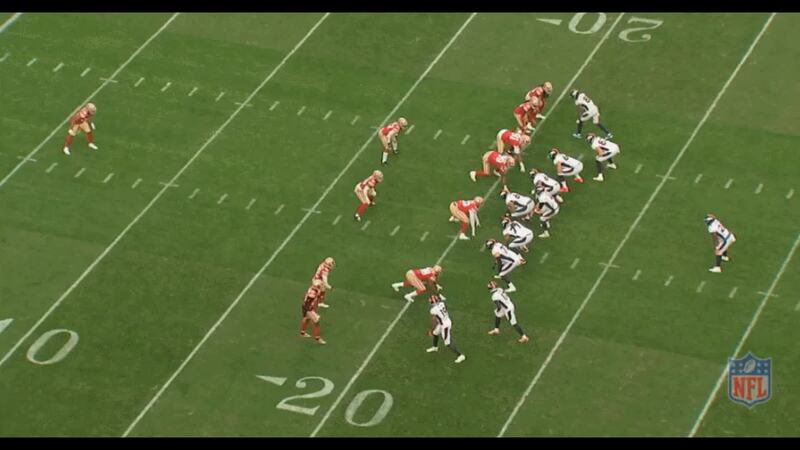 As Wilson executes a play fake, Harris comes up to set the edge in case of a cut back by the running back. Instead, he reads the linemen pass blocking set on the play action since they don't actually get up field and sees Wilson drop back to throw so he sprints after him, forcing him to throw it away. In pass defense, Harris has shown flashes of promise as well, though we shouldn't make any long term predictions based on his sample size as it is one area that will need to improve despite some big plays. His big play potential was on display in the Broncos game however, as he came up with a critical stop on fourth down that prevented the Broncos from scoring any points on a drive they needed points on. Here, the Broncos were running trying to run a pick play with the vertical threat receiver trying to impede the path Harris could take to the running back in the flat to make the stop on fourth down. If Harris had tried to take an underneath path, Lindsay would've been wide open in the flat for a first down and more. Instead, Harris instinctively goes over the top, briefly takes contact with his own man, but gets over the top and outside quick. He tracks the inside hip of Lindsay with leverage inside-out toward the sideline (to prevent cutbacks to the middle) and shoots in for the open field tackle. The play was the difference between the Broncos scoring on that drive and potentially winning the game on their next scoring drive. 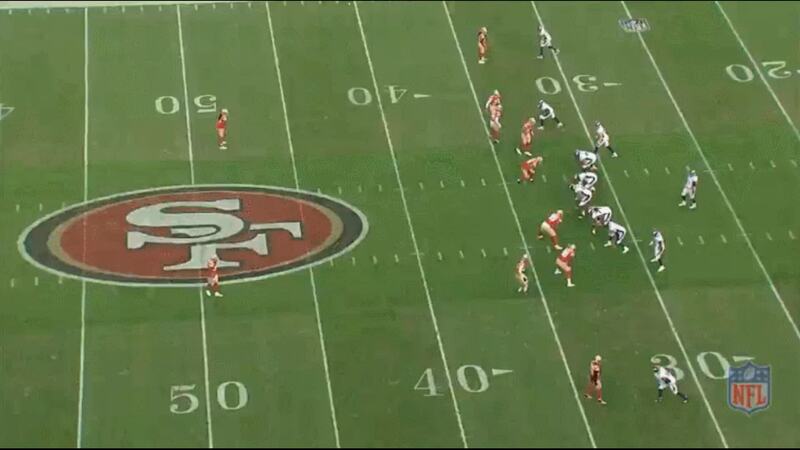 Instead, they gave the ball back to the 49ers to run the clock out before scoring again and pulling within a score. In other areas of pass defense, he made his presence felt as well, limiting what Case Keenum was able to do. 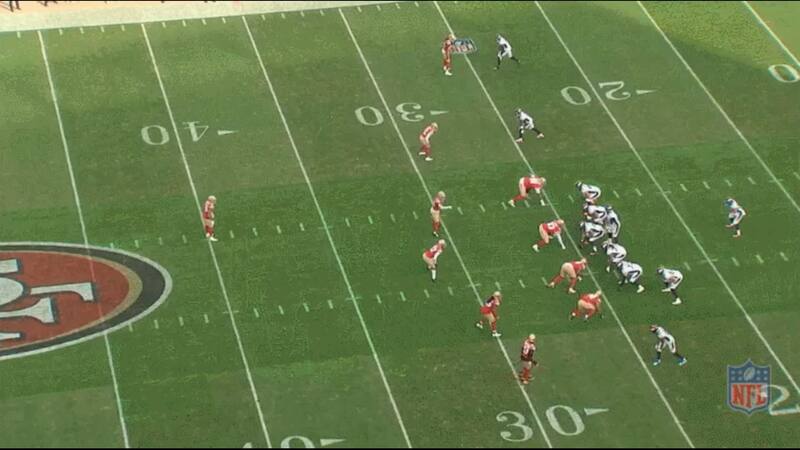 The 49ers are in a cover-2 man shell pre-snap, disguising what eventually would become cover-1 "robber" post-snap. While he didn't make a flashy play here, Harris comes down hill to the middle hook zone to "rob" the underneath curl route where Keenum was looking to throw. Keenum sees Harris drop into the underneath zone, pulls it down and scrambles looking for his next progression before he has to throw it out of bounds. 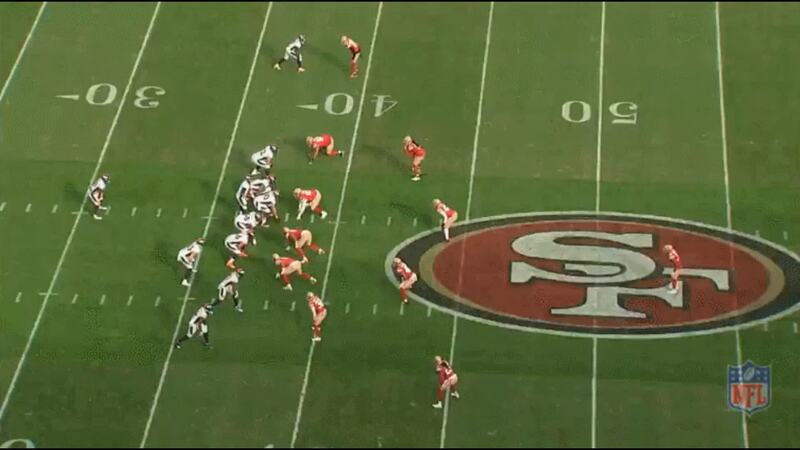 The timing to disrupt the progression shows Harris has very good instincts to read and react to the quarterback. The Broncos likely studied the tape on Harris from the Seattle game prior to this game as it's the only explanation for why they possibly attacked his area of the field on this next play. In the Seattle game, Harris gets caught down near the line of scrimmage on the play action throwback by Wilson. Harris should've kept his eyes on the trips bunch to see if any crosser would leak out the other way but he didn't and Seahawks receiver Jaron Brown goes down the sideline all alone as Wilson finds him for a 45 yard gain. The Broncos look to similarly take advantage of Harris' aggressive pursuit in run defense so they run a similar throwback with Courtland Sutton running the leak route. Keenum boots to the right after the play action goes to the left but immediately looks to throw anticipating the leak route coming open. 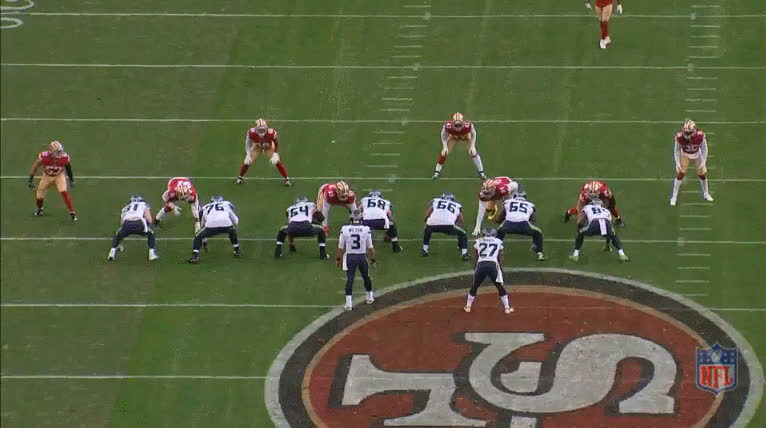 Harris keeps his eyes in the backfield on Keenum this time and sees him looking to throw. As he drops back into a coverage zone, he sees Sutton running into his area of responsibility so he funnels to him and covers him down the sideline. Keenum keys in on Sutton but sees that the route is covered so he immediately looks to dump off but in a bit of miscommunication, his pass falls incomplete to running back Phillip Lindsay. Harris has seemingly learned from his mistake early in the first Seattle game and has shown some good growth while reading play action with speedier guys running into his zone or away from him in an attempt to take advantage of his aggressiveness. Here, the Seahawks run a play action boot toward Harris, this time with routes underneath and behind him. Harris reads the play action and keeps running back Chris Carson in his periphery since he has responsibility for the running back anywhere out of the backfield. Carson takes the fake and sprints out to the flat to the left. 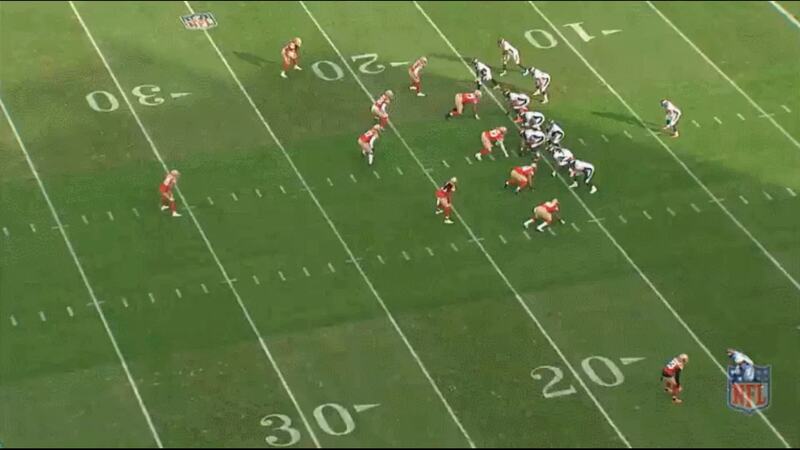 Harris doesn't overly pursue the run action and is therefore able to cover Carson out to the flat. Wilson sees the coverage has bracketed his reads and so he dumps off to Carson in the flat. Harris is right there shadowing him in the flat and is able to toss him out bounds as soon as Carson catches the pass. The primary area Harris still needs to improve on is reading and reacting to misdirection and play action and demonstrating an understanding of run fits and coverage assignments. He can get overly aggressive in his pursuit, causing him to inadequately recover. During play action, he has a tendency to keep his eyes in the back field too long. The Broncos run a reverse with Tim Patrick (No. 81) to the left after faking the outside zone to the right. Harris is on the backside of the play and therefore is responsible for filling the backside alley on the cut back with Ronald Blair (No. 98) as the edge setter. Blair gets caught too far inside down the line of scrimmage and Harris presses the backside cut back lane a bit too much and is walled off by a Broncos defender. If he doesn't press the backside so aggressively, he'd be in prime position to scrape over the top to cut off the running lane and force the reverse to the sideline or up the middle. In the recent Bears game, Harris shows he needs a bit more experience reading the route tree and gets caught looking away from the play side before giving up a big gain in the first quarter. 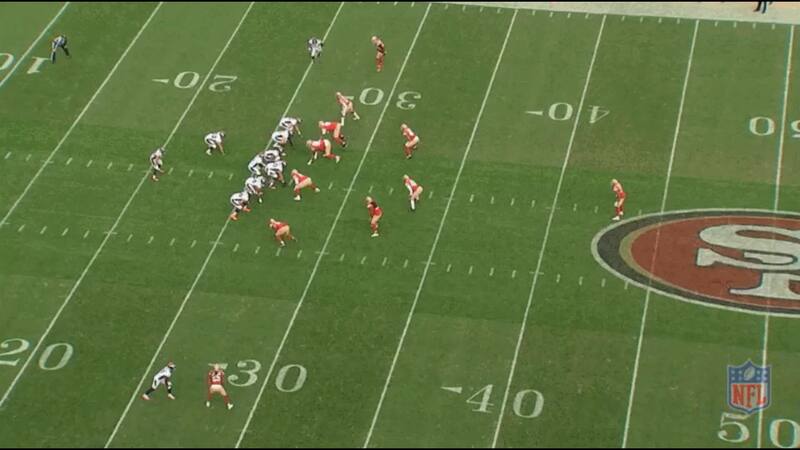 On the first drive of the game, the Bears saw something in the coverage they would look to exploit later on. To the left side of the formation out of shotgun, the Bears run a smash concept (corner/curl combination) with running back Tarik Cohen on the curl route out of the backfield. 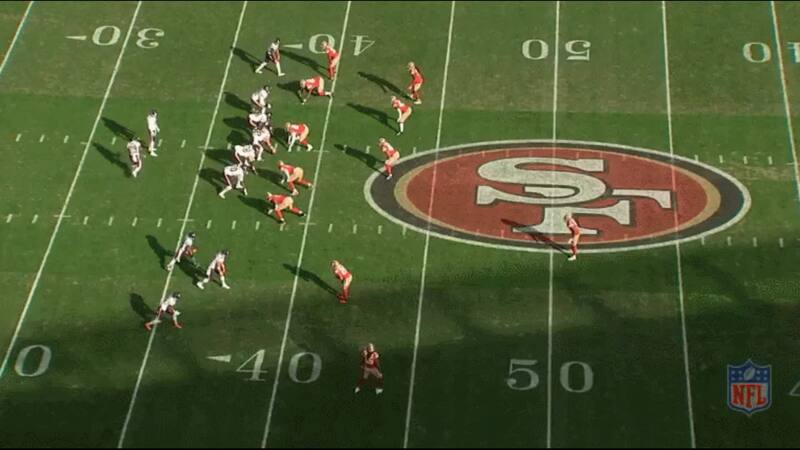 The 49ers played a lot of two-high safety looks to counter the Bears multiple spread attack and defend the deep throws. Trubisky looks underneath to the curl route but comes off late to receiver Allen Robinson (No. 11) running the corner route. Harris sees Trubisky wind up to throw and breaks underneath the corner route, forcing Trubisky to throw over the top between Robinson and sideline but he can't fit the pass in because he was late seeing the route open and Harris' aggressiveness to close on Robinson made it a tighter window to throw into. On the very next drive, Bears head coach Matt Nagy came back to a similar concept and looked to take advantage of Harris' aggressiveness. 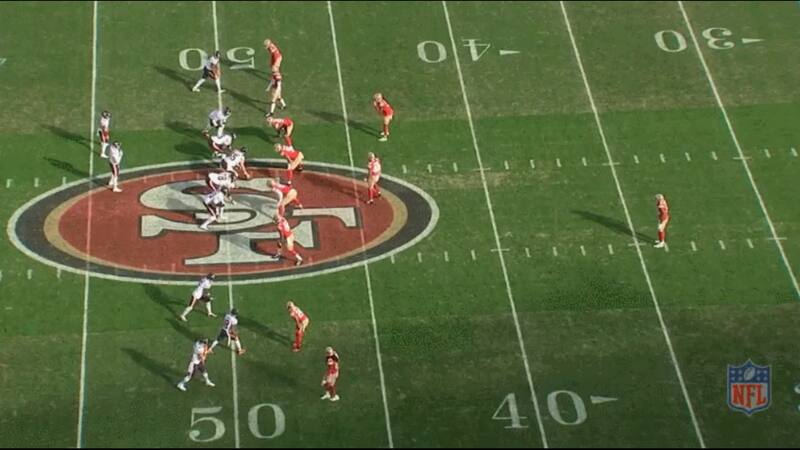 The 49ers are in a cover-2 shell that rolls to "Tampa 2 Invert" at the snap. On Tampa-2 invert the safety to the side of the passing strength drops down into a "robber" zone while the corner to that side drops to the deep half instead of the more traditional linebacker dropping into the middle zone. 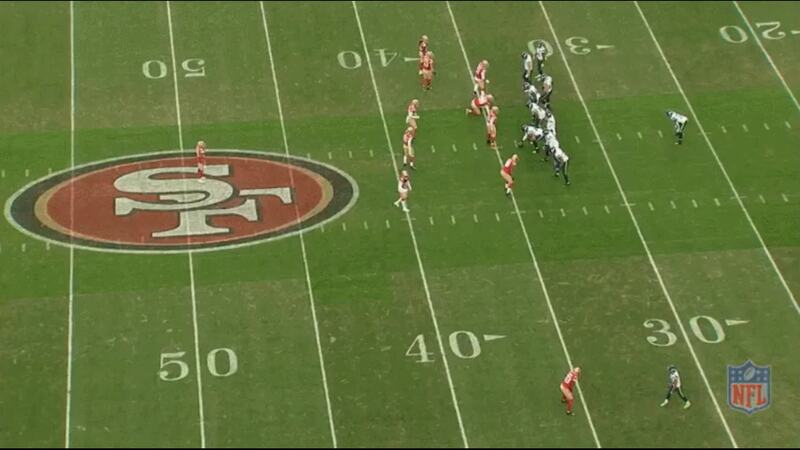 Harris has deep half responsibility down the sideline as the corner underneath sinks to the flat. As Trubisky drops back, Harris begins his drop back and sees Robinson break to the corner for a couple of steps and jumped the route. Nagy, anticipating this might happen, had Robinson break up the sideline when this happened, leaving him open by about two yards. Trubisky throws it out in front of Robinson for a 43-yard gain. As the safety with deep half responsibility, he has to get deeper into his zone drop and read the receiver's body language. Robinson cuts out but never looks back or presents himself as a target by getting square to the line of scrimmage, indicating he's probably going to cut back up the sideline, yet Harris still runs with the out cut. It was the only catch he surrendered on the day and it didn't lead to any points for the Bears. Regardless of the mistakes he made, the growth he's shown since Week 13 has been phenomenal. Continued growth is a sign of a coaching staff that is doing the right things schematically to highlight its players' strengths and giving their young rookies and second year players a chance to grow so they can properly evaluate the roster heading into the offseason. One thing is certain, Tartt has some serious competition at the safety position and Harris will be one to watch next season.